It has almost been 5 years now since we got rid of our electric clothes dryer. Living without it hasn’t really been difficult to get used to. You just have to learn to plan ahead when you know you’ll need certain items. You would think that rainy days would put a stop to the laundry, but in my world I don’t have time to wait for the sun to come out. These kids go through clothes and towels like crazy! In order to continue the washing rain or shine, I have a couple of indoor hang drying options which have been working out very well for me. Over the tub I have a 5-line retractable clothesline. When I need to hang clothes indoors, I just pull it out across the tub and pin the clothes up to dry. When company comes over I close the shower curtain to hide my laundry, so it’s totally out of sight. I can usually fit two large loads of laundry on the line. I try not to hang really heavy things like large towels or my husband’s jeans because the weight will make the line permanently sag. Since there weren’t wall studs exactly where the mounting holes were on the unit, my husband screwed a 2×4 board into the studs, then we hung the clothesline to the board. This way we don’t risk the entire thing pulling out of the wall under the weight of the wet clothes. 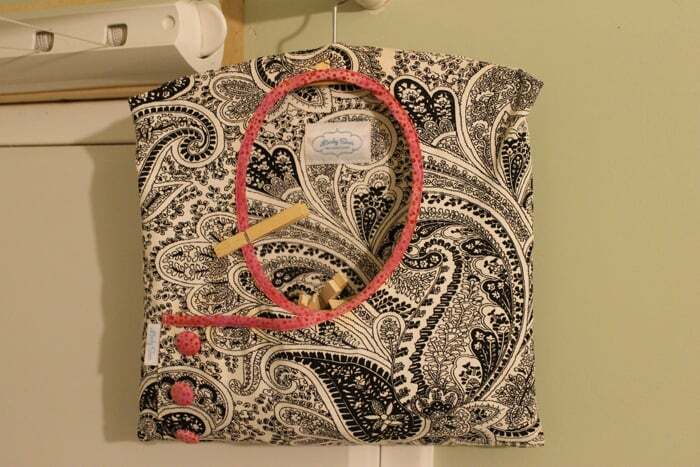 I’ve found a hanging clothespin bag to be super handy for keeping all of my clothespins in one place as I take them off the line. This one is by Lindy Sues. When all of the clothes are off the line it retracts back into itself so that it’s completely out of the way again. 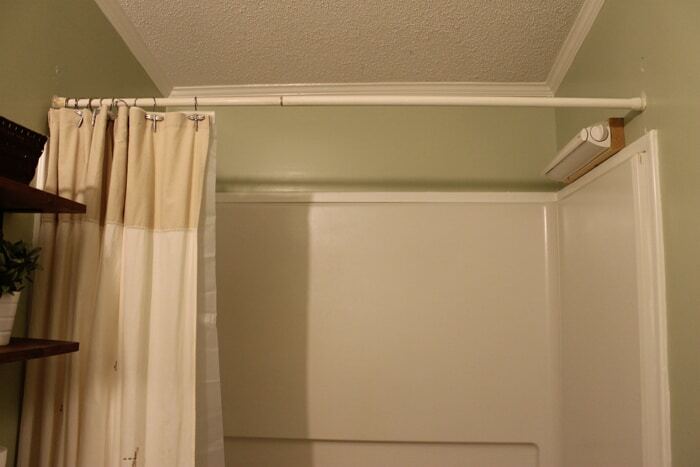 Here’s what the shower/tub looks like with the clothesline empty and retracted. You hardly even know it’s there. If I had two tubs I’d put one of these over each. 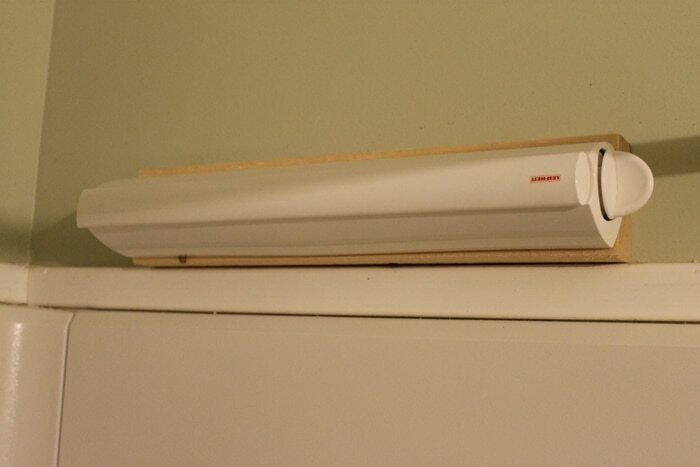 For more indoor drying space, especially for larger or heavier items, an expandable floor dryer rack is a homesteader’s dream. The large wooden one seen in the picture below is a “Homesteader” Drying Rack. Love, love, love this thing! It folds up flat when not in use for easy storage, is super light weight, and is large enough to hang a king sized blanket on. 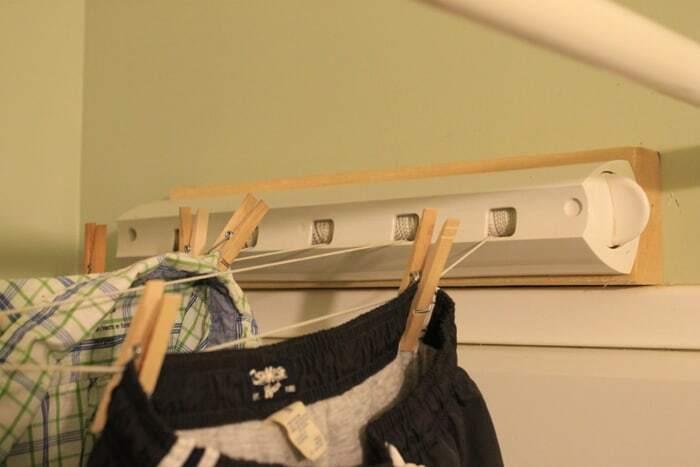 The smaller floor rack is a simple expandable Metal Clothes Drying Rack. It also folds flat when not in use. Sometimes I put the smaller rack in the tub underneath the retractable clothesline if the clothes on it are dripping wet. With all of these indoor laundry drying options I’m able to get 4-5 good sized loads washed and hung no matter what the weather is outside. 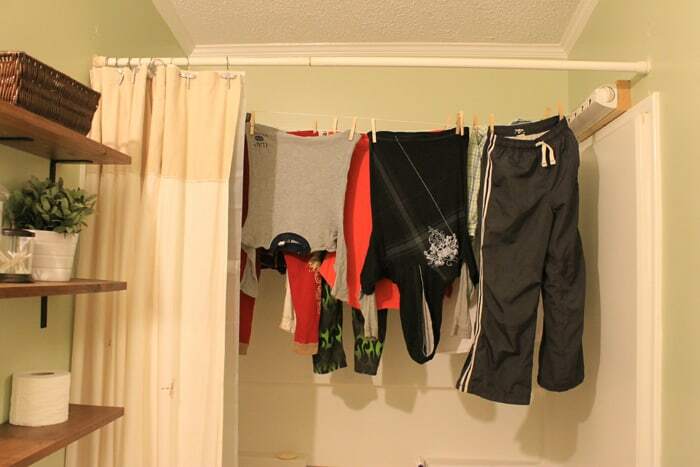 Obviously, hang drying clothes takes much longer than throwing them in a dryer to tumble dry for an hour. 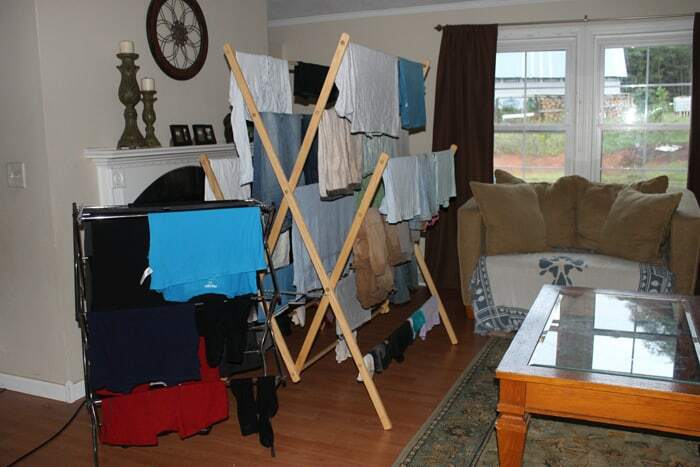 Typically it takes 1-2 days for the laundry to thoroughly dry indoors. If I know we have somewhere we need to be which will require certain clothing, I make sure those clothes are washed and dried two days before we need them. Does it ever get inconvenient? Sure. For instance, at this moment we have absolutely no dry, clean towels in the house. They’re all either in the laundry or hanging wet on the drying racks. It has been raining for a few days, and I just didn’t get to a load of towels before we ran out. Whadyado? You dry off with a wash cloth until the towels are dry. Life goes on. Placing the drying racks in front of the wood stove when it’s burning definitely speeds up the process. It also helps to add much needed humidity to the air in the wintertime when the wood stove is burning non-stop and the air gets super dry. In the summertime, ceiling fans help to speed up the drying process on rainy days. Fans also help keep your clothes from smelling musty when it’s really humid in the house. Hang drying takes time and patience. But honestly, I’ve found it a nice change to simply slow down and enjoy the process. Do I wish I had an electric clothes dryer for the rainy days? Not for a minute. I’ve got everything I need right here! Where did you get the large wooden drying rack? And in the process, you are humidifying your home in those dry winter months. Wire or plastic coat hangers are great for hanging/drying shirts; two clothes pins will secure any size jeans or even 2 pair(if small). Hang on doorway trim when no one is around. There are old fashioned metal clips that hold coat hangers from sliding all together on a line, but putting a permanent knot or loop every 4-6 inches would work also, inside or outside. Look up images of antique or vintage wall mount clothes hanger; hang above a wood stove; some fold up and away when not in use. In order to avoid wrinkles, hang shirts upside down from the bottom hem and hang pants from the cuffs. 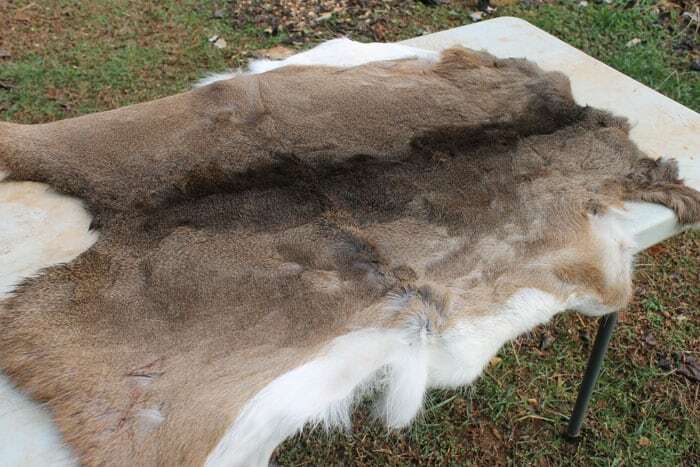 The wrinkles will pull out during the drying process from the weight of the clothes. I love that you guys are doing this full-time, Kendra! What do you do about the towels and jeans drying so hard and crunchy – does that happen to you? I never had a dryer and probably will not ever have one. I lived in Africa for 23 years and for safety we always hang our clothes on line inside double garage, but now in Serbia I dry our laundry outside or in my husband’s workshop attached to the house when weather is bad – it usually dries overnight. But there is another thing I want to tell you: when my washing machine is done I take each item and shake it vigorously and fold (still wet) and pack pieces on top of each other leaving them like that for a while (few hours or overnight). 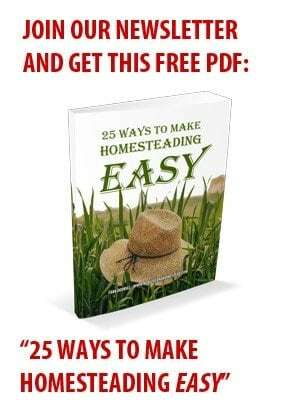 Than, when hanging it to dry, I shake it again and pin – and also pay attention when I take it of the clothesline no to scrunch it, but fold it! When it comes to final folding – my clothes look like that they have been partly ironed! I never would have thought to fold wet clothes for a while. Interesting! I have my wood burning stove in the basement that heats my whole housel( 4BR 2Bath) and in the winter I get to “hang” my clothes on hangers which I then hang from the ceiling 2x4s. Even my sons jeans with 36″ inseams, double up to fit the hanger and then doubled again to hang over the bottom of the hanger, dry in about 3hrs 🙂 Love, love, love using what God has supplied, the sun and the wood, to dry my clothes instead of electricity. We have hung clothes in our house for 59 years, lol. When my dad designed and built this house, there was no room for a dryer and I’m not sure they were even around. Or at least they were brand new, lol. We love drying indoors. Most of the time our clothes are dry within 12 hours. In summer, the dry even quicker, lol.